Mars is a great planet to explore. I have always been personally interested in Mars because Mars is home to Olympus Mons the largest volcano on the planet that’s bigger than Mount Everest. 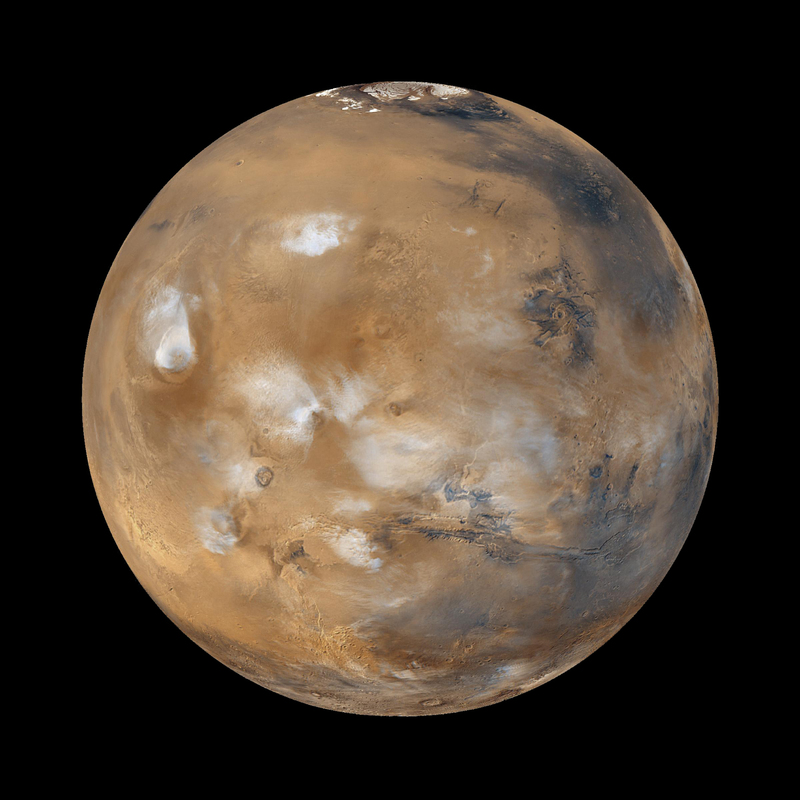 I also like the dust devils on the surface of Mars and Mars two moons Deimos and Phobos. One day Phobos will fly closer to the planet and will soon crash while Deimos will orbit further and further away! Here at the Adler Planetarium, I am an Astro-Journalist intern, where I am exploring Mars more closely through the wonders of citizen science. The thing that I am using is called the Zooniverse which is a website that lists a lot citizen science projects. Planet 4 is a project where people look at the surface of Mars to map out different features. The different types of features that can be found on Mars’s surface are caused by winds and the changing of the seasons. The specific features people are looking for are either called “fans” or “blotches”. During the Martian spring, the sun travels through a layer of dry ice and melts the stuff that’s underneath it. The melted stuff becomes a gas trapped under the ice, and so pressure builds up as more stuff is melted. Consequently the gas bursts through the layer of dry ice to the surface, taking dirt and dust with it. That dirt and dust land back on the surface as a “blotch”. If there is wind that blows the dirt and dust over into a paddle shape, it is called a “fan”. The picture below shows fans on Mars. 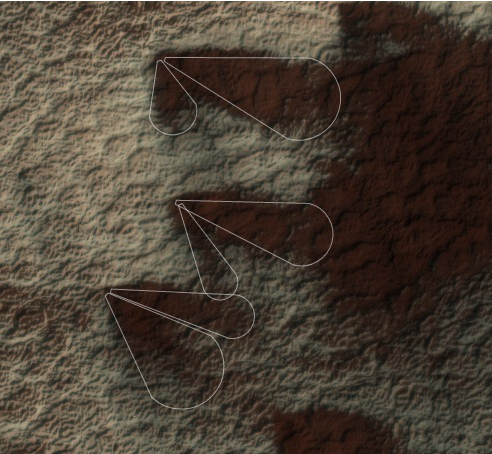 The picture is taken from Planet 4’s website and the white lines show how users mark the fans. The picture below shows example blotches on Mars. 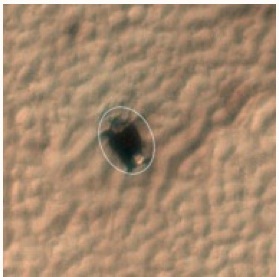 The picture is taken from Planet 4’s website and the white lines show how users mark the blotches. After citizens classify a year worth of data, scientists are able to look at the wind patterns to see changes in Martian weather over that year. Imagine having the job of studying space and all of its mysteries… mysteries that took billions upon billions of years in the making. What if your job was to study the history behind types of galaxies? Such a task sounds too big for even mankind to take on, so today’s astronomers are asking for all the help they can get. On the wonderful invention you are currently using, the internet, there are many ways to make a contribution to astronomy. Astronomers at the Galaxy Zoo zooniverse project have created a way for anyone to be able to help them in their search for answers to all of their galaxy-related questions. While using the Galaxy Zoo website, you will be looking at an image of a galaxy and answering many different “yes” or “no” questions that will help the astronomers behind the Galaxy Zoo project categorize the galaxy that was in your image. The more pictures that you go through, the more information will be given to the astronomers to later be able to generalize the different kinds of galaxies and eventually could lead to a new category of galaxies. One of the many galaxies that you will see while going through the activity is the spiral galaxy. Our own galaxy, the Milky Way, falls into this category. Spiral galaxies themselves are commonly categorized into four separate groups, the universal default categories being A,B,C, and D. Category A includes the different spiral galaxies whose “arms” are closely formed together and category D, on the opposite side of the spectrum includes all spiral galaxies whose “arms” are formed loosely and fan out. There are three main parts to a spiral galaxy; a nuclear bulge, a disk and a halo as shown below. Along with spiral galaxies, there are also elliptical galaxies who are the more ordinary of the galaxies in terms of looks. These galaxies are often mistaken for stars with there being a source of light in the center of the galaxy and having an oval shape in images. Because elliptical galaxies tend to have older stars, there is less gas in the galaxy to create newer stars. Because of this, most astronomers believe that these are the most mature kind of galaxy and there is also the belief that there is a supermassive black hole at the center of every elliptical galaxy. Finally, there are the misfits of the galaxy classification field. These are the galaxies that are not completely visible through a telescope because there are different areas of the galaxy that have stars blocked out by dust and other debris. There are no set patterns or symmetry in the galaxy that humans are aware of so these galaxies receive their own category. Through this program, the astronomers are asking for images of different types of galaxies to be analyzed by interested and curious people. The different types of galaxies are able to tell astronomers a lot more information varying from the rough time period the galaxy began to form to the different ways that certain galaxies take shape. With this information we could soon come to learn about our own galaxy and even perhaps lead to more theories on how the universe and all of space was created. Adler Zoo Nyverse: Greetings! Welcome to the first post of a 3 week mini-series dedicated to exploring Radio Galaxy Zoo, a new citizen science project. My name is Adler Zoo Nyverse, and I will be your host for these next couple of weeks. I would like to welcome Professor Hubble and Professor Kepler. Gentlemen, welcome, and thank you for being with us today. P. Kepler: The pleasure is all mine. Adler Zoo Nyverse: So let’s start off with this concept of gravity, one that is confusing for many people. What IS GRAVITY? P. Kepler: Commonly, gravity is considered to be an interaction which occurs between any two things that are made out of matter. Gravity is an attractive force which means that it pulls things together. When objects are closer, the force between them is stronger. Sometimes we refer to the gravitational fields of an object. The gravitational field of an object increases with its mass and decreases with its size. P. Hubble: For example, the Earth’s mass and size creates a gravity that pulls things to the ground. Since the Earth’s mass is relatively big (a modest 5.97219 x 10^24 kilograms) it takes powerful engines to break free from the grip of the Earth’s gravity and make it to space. The speed need to break free from Earth’s gravitational field is known as escape velocity. You can almost think of the situation as pedaling up a steep hill: if you don’t start with a high enough speed, you won’t be able to get past the hill and will fall back down again. A black hole’s escape velocity is greater than the speed of light. This means that even light cannot escape a black hole; since the speed of light is the universal speed limit, nothing is fast enough to escape the field of a black hole. Note that if the Earth was crushed to a very small size but kept the same mass, that the escape velocity becomes higher than the speed of light, making Earth a black hole. Not to worry though, Earth is very stable and won’t collapse into a black hole. Adler Zoo Nyverse: So we all know about black holes and how they are really powerful. Can you explain what role gravity plays in the properties of a black hole? P. Kepler: Black holes’ have very strong gravitational fields because they are so dense meaning that they are very massive but take up very little space. When a black hole has a companion star nearby it, matter from the companion star often gets sucked in by the black hole and forms a disk around it. This disk tends to emit radiation due to immense amounts of friction within the disk. If parts of the star fall on the disk, large jets of electrically charged particles can be produced. Here is an artist’s depiction of the jets coming from a black hole in the center of a galaxy . Adler Zoo Nyverse: Fascinating! But how can we see these wonderful acts of nature firsthand? Is it possible for powerful telescopes to detect them? P. Hubble: Well unfortunately, it is impossible to actually SEE a black hole. However, if one were to find themselves in the possession of a KG Jansky Very Large Array (NRAO) or an Australia Telescope Compact Array (CSIRO) then one could observe the jets that a black hole emits. Adler Zoo Nyverse: So all this is great, but I don’t think most of us have such fancy telescopes lying around in our living rooms. So how can people like us pitch in and help? You know…the average science-enthusiast? P. Kepler: Zooniverse, a citizen science web portal designed to allow citizens to help scientific research, has a project known as Radio Galaxy Zoo. This project is interested in learning more about supermassive black holes, which are possibly formed when different galaxies collide. These black holes tend to exist in the center of galaxies and are billions of times more massive than our own sun. 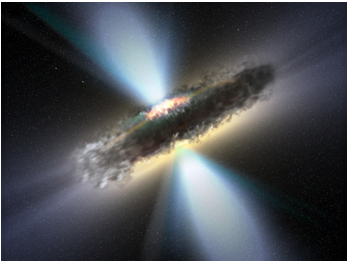 Radio Galaxy Zoo needs the help of citizen scientists to identify jets that massive black holes tend to form, and associate them with the host galaxies of the black holes. Humans are required for this task because jets and galaxies can sometimes overlap and form complex patterns, and humans are much better at being able to interpret patterns than computers. Radio images (like that above) are used to identify the jets since the jets produce radio waves and are thus detectable by radio telescopes. The contours (in white) help emphasize the jets of the black holes and between the two jets, one should be able to trace the origin of the black hole. In order to help identify the associated galaxies that the black hole sits in we look at infrared images (like that above), since the dust in galaxies emanate infrared radiation. Infrared images show us signs of the galaxy. 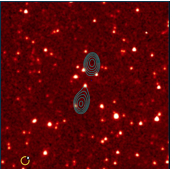 An infrared source between the contours is clearly seen here, whereas one could not see it in the radio images, showing the need for both kinds of telescopes. Notice that the look of black holes is all a matter of perspective. The image above is combined infrared and radio light and the contours tracing the jets of a black hole are highlighted when being oriented by like the artist’s interpretation (see above). Compare this with the image below. 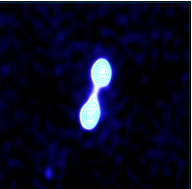 While black holes usually have a pair of jets, sometimes depending on what point of view the image was taken from, there appears to be only one jet, as is the case in this image. In reality, there are always two. Here, the image shows only one jet, but that is because one is looking at the jet head on, rather than from a different angle. Adler Zoo Nyverse: Fascinating! Well it has been a pleasure to hear from bothof you. Thank you to everyone who has been reading! Check back next week for the next installment!